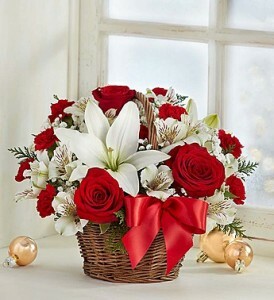 We have hand-arranged the freshest red roses, white lilies and greens inside a charming handled basket. Filled with the classic colors of Christmas, our exclusive bouquet is an inspired way to thank the party hostess. 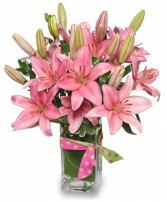 Or use it as a centerpiece in your own holiday home, during the holidays or anytime this winter. Small does not have Roses or Lilies. Are you ready to make sure they have a bright, sunshiny day? 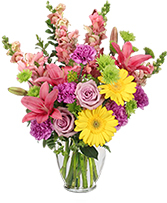 Then this Spring arrangement is the one for you! 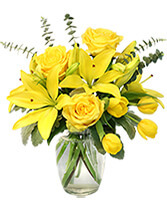 Cheery yellow roses, tulips, and lilies are just the thing to brighten their spirit no matter what the occasion. Colors may vary due to availabilty.